This new proposal won’t get Coastal Gaslink out of trouble with Unist’ot’en, because it would still cross their territory, 5 kilometers north of the current occupation site. This doesn’t bode well for the consortium of pipeline companies collaborating on a unified route to Kitimat. We wonder if Coastal Gaslink will be the first to break ranks with the tarsands and fracking pipeline cartel. Another piece of news relates to the likely reason for the logging and police presence last month. We were worried the pipeline companies and RCMP were about to move in permanently. Camp life is returning to normal as the first blizzards of the season start moving through the mountains. The clan is calling for past volunteers to return to the camp this fall and winter. Get info and share your plans to be part of the reunion. Or call Zoe at 250-813-3569 for the latest news. This community is a mainstay of support for Unist’ot’en Camp through the cold mountain winter. Please sponsor the Caravan today. Unist’ot’en Camp has allies around the world. You can support the legal fund or contribute directly to the camp. 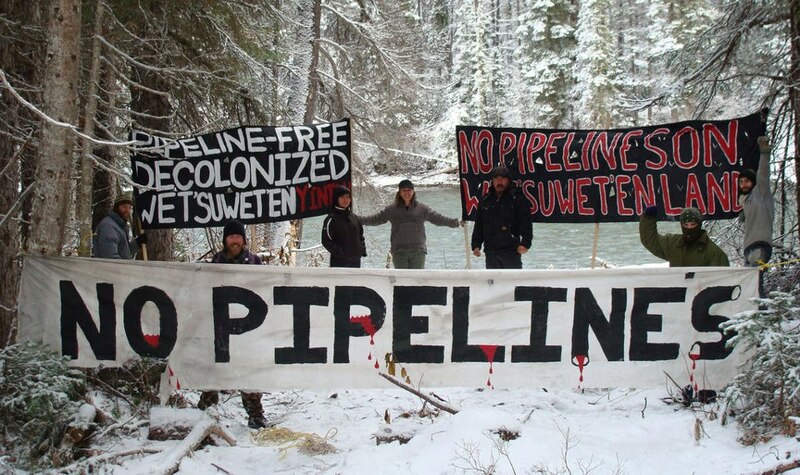 Posted on October 12, 2015, in Oil & Gas and tagged anti-pipeline resistance, Coastal GasLink, natural gas pipeline, oil and gas pipelines+Indigenous resistance, Unis’tot’en, Wet'suwet'en. Bookmark the permalink. 1 Comment.